Poughkeepsie’s newest waterfront dining destination is located off Water Street, five hundred feet north of Main Street (and River Station). If the place was any closer to the Hudson you would get wet (which actually happened recently during Hurricane Sandy.) The building that houses the restaurant has been put to good use, after serving as the Waryas Park snack bar for many years. Local builder, Kevin Lund saw more potential for the location and the results of the renovation efforts are quite extraordinary. Along with sons Michael and Mathew and co-owner Tom Rolston, he opened the new riverfront eatery last fall. 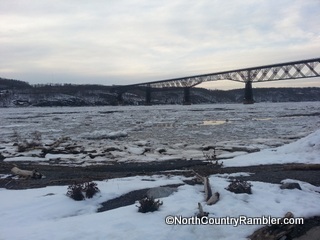 The bar and restaurant dining room serve as a river front theater – looking out on the Mid Hudson bridge just south, and the Walkway over the Hudson nee Poughkeepsie Railroad Bridge to the north. The tables in the center of the dining room are “hightops”, which allow for a view over the window tables, and the booths along the back wall are on a raised platform allowing an unobstructed view over the hightops. There isn’t a bad seat in the house. 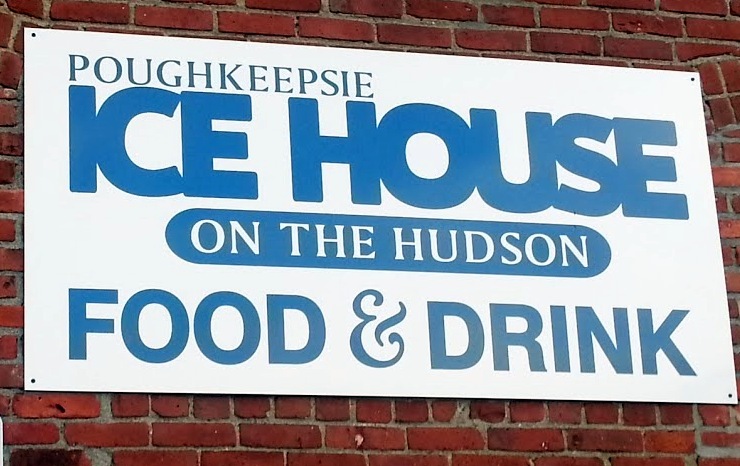 The Ice House dining room overlooks the Hudson. A large outdoor patio will allow for additional seasonal seating literally to the water’s edge during the summer. The exposed brick walls of the dining rooms are complemented with period fixtures. A large expedition canoe which has been refitted as an enormous light fixture hangs in the center of the dining room ceiling. Someone put quite a lot of thought (and I assume a lot of money) into the design and buildout, and it really shows. Taken from the Ice House looking north. We stopped in again for dinner last Wednesday, and once again there was not an empty seat in the house. The separate bar and lounge has attracted a regular following already. I did notice that everyone sitting at the bar last Wednesday evening was having a glass of wine and having something to eat right at the bar. I like that. The Ice House has only a beer and wine license (no hard liquor), which I suspect has been restricted due to the City’s ownership of the building and its legacy as a park facility. The menu at Ice House is replete with New American / upscale casual offerings. Nothing fancy – no haute cuisine – but decidedly more ambitious that the typical riverfront lobster / burger / fried fish / offerings of many other local riverfront eateries. The “casual” part of the dining experience sometimes lists towards wobbly as the new staff finds its sea legs, but they get A’s for effort and friendliness, especially given the mob scene that we have encountered on our three visits there. The restaurant menu offers a little something for every palate, including a daily special. We had eight tablemates at dinner this week so we did get to sample many if not most of the appetizers. Our favorites included the crab cakes ($12)- served with baby arugula and a perky aoili dipping sauce spiked with Chesapeake Old Bay seasoning. Nice touch. A healthy serving of crispy calamari ($11) was cooked with toasted rosemary, which was a novel and most enjoyable take on this familiar dish. A platter of seared sea scallops ($13) were served perched on a spinach parmigiana base, super rich but very tasty. Our first visit was also on a Wednesday which just happens to be Chef’s Choice grilled chicken night. Our waitress informed us that the Chef’s Choice was Chicken Marsala, which a few of us ordered. When plates of grilled chicken breast topped slices of ham and melted cheese appeared, I asked the waitress if perhaps she had brought us someone else’s dinner. She assured us that this was the kitchen’s own version of Chicken Marsala (and not what appeared to be two plates of grilled chicken cordon bleu.) It was delicious, but – note to chef – Chicken Marsala is sauteed in a mushroom sauce finished with…..wait for it…. Marsala wine. I dove right back into the chicken this week with the regular menu offering of Pasta Lucia ($18) – tossed with an Alfredo sauce chock full of sun dried tomato, grilled chicken, sauteed red peppers and spinach, and salty shavings of prosciutto. Very nice combination. A wintry “comfort food” platter of molasses and cider braised short ribs ($24) also hit the mark, as did the seared Ahi tuna ($24) served with a sesame ginger rice. I suspect my next visit might be for a quick dinner at the bar, and I already know it will include an appetizer of coconut shrimp ($11). Before you stick up your nose at that suggestion, give these a try – a generous serving of colossal size shrimp paired with a very nice ginger laced dipping sauce. That and a Caesar salad ($9) will be more than enough for dinner for me. I most look forward to visiting the Ice House during the summer for a river front Al Fresco lunch, where I suspect I will see many of you too. Spring is just around the corner! To the river!